In 2011, Felena Hanson founded the coworking space Hera Hub in San Diego. Not only was the company pioneering in the sense that it offered coworking space — that was a brand-spanking-new concept in those days — it also provided coworking space specifically for female entrepreneurs. Hera Hub’s female-focused space put it in direct contrast to the “bro” culture at many big-box coworking spaces, Hanson says. Since 2016, the company has grown through a licensing model. Besides three locations in greater San Diego, it has locations in Washington, D.C., Phoenix and Uppsala, Sweden. Other Hera Hubs are planned for the U.S. and Europe. Bisnow spoke with Hanson about her concept and why she isn’t worried about competition from the major coworking chains. Bisnow: How is it that WeWork and other major chains aren’t going to drive independent coworking like yours out of business? Hanson: Before WeWork opened its first location in downtown San Diego, which was in December 2016, I found myself explaining to most people what coworking space is. Now, thanks to WeWork’s heavy spend on advertising, almost everyone is aware of the concept. Companies like WeWork have made coworking mainstream. For a small coworking space operator like myself, that saves me a significant amount of energy on educating the market. Someone may see an ad or have attended an event at a WeWork and then be prompted to do a search of the market for coworking space. Bisnow: So WeWork’s expansion isn’t harming your business? Hanson: The short answer is no. Admittedly, we’ve lost a couple members over the last two years because they needed a private or dedicated office. Those individuals outgrew us. I think of WeWork like Starbucks. It took an existing concept and put a different spin on it, but that spin isn’t right for everyone. Starbucks expanded rapidly and everyone worried that they would run independent coffee shops out of town. But by and large, Starbucks — and WeWork — have grown the pie and local establishments still have a very prominent place in the market. Bisnow: What does independent coworking space need to compete against the big operators? Hanson: People gravitate to the right environment for them. If rubbing elbows with the founders of the next big tech concept is important, then WeWork might be a good fit. If someone looks forward to Taco Tuesday or loves Ping-Pong to blow off some steam, then places like WeWork might be a good fit. But there are many other locally owned and operated coworking options on the market. Bisnow: How did you get the idea for Hera Hub? Hanson: Hera Hub grew out of my personal need for flexible work, meeting and event space. I found myself pushed into entrepreneurship after being laid off from a marketing director position with a San Diego-based high-tech company in 2003. I launched a marketing strategy consulting firm, Perspective Marketing, and found it convenient and cost effective to work from home. Yet after a couple years, I found working from home to be, at times, distracting and isolating. Shortly after launching my consulting practice, I took on a leadership position with several professional women’s organizations, Women’s Global Network and Ladies Who Launch, San Diego. In this role I found myself constantly challenged to secure cost-effective event and workshop space for monthly meetings. Bisnow: That led you to the concept of coworking? Hanson: I was turned on to the concept of coworking in 2010, when I hosted a networking event for an organization I was leading at San Diego’s first coworking space, the Hive Haus. I initially thought about how I might use the space for my own marketing strategy business, but quickly realized a 30-something woman wasn’t their target demographic. They were targeting tech startups. That is, primarily young men. The space was cool — outfitted with a Ping-Pong table and beer keg — perhaps a little too cool for me. The experience did spark an idea. Why wasn’t there a space for someone who wanted a professional and productive environment in a beautiful, inviting setting? Thus the concept for Hera Hub was born, named after the Greek goddess of women. It took about 12 months from the time I decided to move forward with the launch of Hera Hub to the point where I completed my business plan, secured financing and solidified my first location. Bisnow: What makes it distinctive? 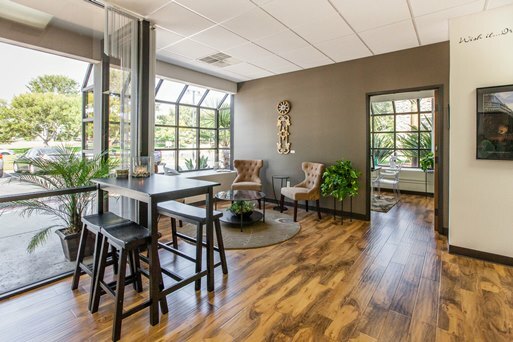 Hanson: Hera Hub differentiates itself from most coworking spaces, not only because of our spa-inspired theme — think water features, aromatherapy candles and soft music — but because of our sense of community. Members have access to programming, including weekly business development workshops, access to mentors, and a variety of other business education to support women. Bisnow: What has been the reaction to it? Hanson: Positive. I truly believe that women interact differently and are instinctively more collaborative in their approach to business. I felt it was important to create a space for female entrepreneurs that’s not only beautiful, comfortable and feminine, but also professional. In a recent article in Bisnow, Felena Hanson founder of Hera Hub shares How Independent Coworking Spaces Can Compete With WeWork.